Be sure to also check out the Harper Decoder which explains all things Harper PTO specific. Register! Check the district registration page for the entire process. You will need 2 proofs of address in order to register, such as a bill AND a closing or rental agreement, as well as birth certificates or passports for your children. As part of this process, you will be directed to an online form to complete registration. In order to be included in the Harper school directory (online and print), be sure to select that you want your information to be shared with other families. Connect with the welcoming committee to get looped into the community. Be sure you opt into the list of new families to be contacted by the welcoming committee (this is a field within the registration link). This will not make your information public, but will enable the welcoming committee and host families to know you have joined the school and include you in events and activities geared towards helping you and your child settle in and get connected. School Supplies: Check the website for the school supplies list. The PTO coordinates school supply boxes in the Spring before each new school year. If you were not enrolled in time, you can contact Sue DeThomas at schoolkits@harperpto.com to enquire if there are any extras that were ordered. This is usually the case, so definitely worth it to check. Shopping that school list can be a bit laborious if you haven’t got much time before school starts. Sync your Calendar: Check the school calendar for all important district and school dates. The first day is an abbreviated day for D39 elementary schools. There is an opening day coffee for parents in our cafeteria where you can sign up for volunteer positions as well as pay PTO dues, buy tickets for our school events and purchase Harper Spirit Wear. It is a great chance to start meeting other parents. Come to the New Families welcome night! As long as you’ve shared your contact information through the online registration process, the welcoming committee will be able to connect with you about the New Families welcome night. This event will include a brief introduction from the principal, the PTO representatives and a tour of the school. (If you have not completed the formal registration process, please contact the welcoming committee at welcoming@harperpto.com directly so we can add you to any communications regarding new family events). Pay school fees: These fees are for instructional materials used in the classroom, among other things. Complete medical forms: Every child needs a physical to start school, and ideally eye doctor forms and dentist forms completed. A doctor’s physical is a must. If you need a referral to a doctor don’t hesitate to ask your host family or the welcoming committee. If you can’t get an eye doctor and dentist visit in before school starts consult with the nurse to determine the deadlines for submitting those. Bus/Transportation: If applicable, you have the option of busing one or both ways and can join at any time. Lunch Money: All student lunch fees are direct deducted from an online account that you can deposit a lump sum into. Visit the D39 food services website for more information about lunch at Harper. (All of your children’s lunch accounts are linked if they are in different schools across the district. So you deposit one lump sum that allows each of your children to draw from the same funds. There is $4.95 charge to make this payment online. Alternately, you can bring a check to the school or the Mikaelian Education Center (MEC) at 615 Locust Road, and incur NO fee. School lunch menus are posted online. 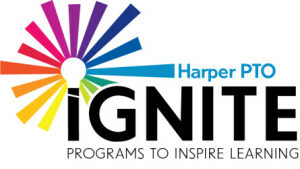 Ignite: This is the main fundraising effort for the Harper PTO. While your $20 dues towards the Harper PTO helps support the PTO, it does not cover all the enrichment activities and safety benefits that our children receive. Harper asks for a year donation to iGNITE of $125 per child. These funds go toward guest visits from authors, scientists, theater groups, field trips, additional curriculum based equipment and paying our crossing guards for the pick up and drop off process. Currently, we do not participate in other sales such as wrapping paper sales, cookie orders, or fundraising programs – only this one time payment to cover the cost of each child attending Harper. PTO dues (A to Z): PTO dues are $20. This will give you access to our online parent/family directory. For an additional $5 you will receive a printed version of the Harper directory which is particularly helpful when meeting new people, planning birthday parties, etc. Lunch money: Deposit money in lunch account within the school, online, or with the Mikaelian Education Center. Curriculum Night: Mark your diary for curriculum night which will be in mid-September. Check the school calendar for the exact date. Also, be sure to read the weekly Harper Happenings email for date and details. This is a chance to visit your child’s classroom with other parents and discuss what your child’s school year and learning will be like. Host family contact: The welcoming committee does its best to connect you with a host family. Ideally we will match you with someone who has a child in your child (children’s) grade. Because class assignments do not come out until the week before school it is often not possible to match you with a host family who has a child in your child’s class. You should hear from your host family sometime in August. PTO sign up/meet and greet coffee: This will be held in the cafeteria on the first day of school. Mingle in the Park (TBD): Depending on time available and weather, the welcoming committee attempts to host a casual get together at Thornwood Park to give new parents and kids a chance to meet some current parents and students at Harper. Where to line up: Your child will line up with his/her grade and enter the school by themselves. Teachers/TAs come out to give access to the building. Kindergarten and 1st grade lines up by the south doors (next to the school garden, by the gym). First day logistics: It’s a good idea to send your child to school with a water bottle and snack (this can ONLY be fresh fruit or vegetable), and his/her school supplies, if they were not ordered through the school program . They are NOT required on the first day, so don’t panic if you haven’t gotten them yet. If your child has a school kit that was ordered through the PTO, it will be at the school in the first days. The first day is usually a half day, so kids can get acquainted with their new teacher and classmates and understand the process/expectations of their classroom and the school. They will be dismissed before lunch. This is at 12:15pm for 1-4th grade. Please check with your kindergarten teacher for exact dismissal times for kindergarten students. Specific instructions and release times for kindergarten will be sent to parents of kindergarteners. Pick Up/Drop Off Proceedures: Enter the car pool lane from Kenilworth and Dartmouth. Pull slowly up along Dartmouth. Pull up as far as possible up past Thornwood, and then drop your child safely along the sidewalk on Dartmouth between Thornwood and Greenwood. DO NOT leave gaps between cars. More about this process can be found here. Pet/scooter/bike policy: Bikes and scooters must not be ridden on the sidewalks in front of school. Dogs are not to be walked on the sidewalks directly in front of school, for the safety and security of the children on school property. Classroom snacks: Daytime snacks at school can only be fresh fruits and vegetables. Birthdays/Party snacks: Parents are generally welcome by the class teacher to come in and read to the class. No cakes or sweets of any kind are allowed in the classroom. Sometimes games or small giveaways are sometimes allowed. Discuss with your child’s classroom teacher what they will allow. Parent support in the school: Volunteer opportunities such as lunch, library, garden or classroom help (from the teacher) are available year round. Check the PTO website, the weekly newsletters or visit the Facebook Harper parents page. After school clubs: these will be advertised in the Harper Happenings weekly newsletter (via email) and on the Harper PTO website. These are run in the winter term, so there will be plenty of notice for sign up. Extra pair of shoes for PE: Each child will have to have a “clean” pair of shoes to be worn for ONLY inside PE activities. These shoes will be left in the lockers. School Safe Phone: If your child is ill, has a doctor appointment or will be late/absent for any other reason call the Safe Phone (rolls over to the nurse) 1-847-251-6754. Park district sign ups/events: While this may not seem related to school, you will all too quickly find out that the park district puts teams together based on grade and schools. So many children play soccer, particularly, that knowing the sign up date is often the key to ensuring that your child gets put on a team with classmates (or other same year students from their school). Check the Wilmette Park District website for current activities and classes sign up deadlines. Popsicle parties: These casual gatherings are coordinated by classroom parent representative(s). It’s a great opportunity to meet at Thornwood Park, have some popsicles and get to know your child’s classmates and their parents or caregivers. Be sure to connect with your classroom parent to make sure you know which day your class decides to do this.